Many thanks to the publishers of the magazines below, and to the reporters who wrote the nice articles! 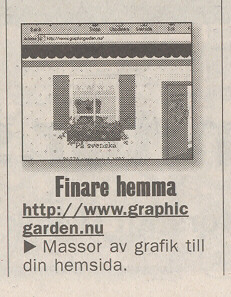 If you'd ever see Graphic Garden mentioned in a printed magazine etc., please tell me about it. There is a reward for the first person who reports such an issue, if you're willing to send me a copy of the magazine. When I was visiting my hometown Skellefteå (where my parents and brother still live, in the north of Sweden) the local newspaper Norra Västerbotten wanted to interview me. The posted it on March 7. 2005. It's a very nicely written article about my education, interests, why we moved to Norway and of course a lot about drawing and how I got started with Graphic Garden and what it's like now. 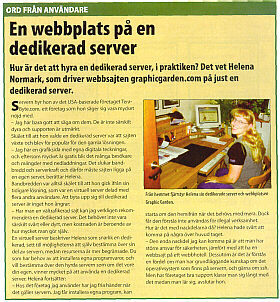 Swedish computer magazine 'Allt om PC' ('All about PCs'), volume #1 2005, had an article about dedicated servers. 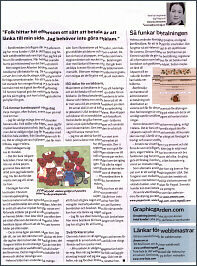 Graphic Garden runs on such a server, so they interviewed me about it. Among other things they asked me about the site, what it's like to maintain a server myself, if it's difficult, what the cost is etc.. 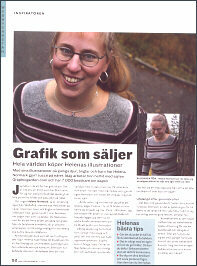 In December 2003 there was a two page article in the Swedish version of the InternetWorld magazine (Issue #11). Unfortunately they didn't post it at their site and for copyright reasons I'm not allowed to post it here in readable format, but below you can see what it looked like. If the garden of the neighbour is always greener.....you have to visit the very beautiful site of Helen. She is a swedish girl with a passion for design and web. From the union of these two loves, one of the most delightful sites of internet is born! It's called Graphic Garden and it put at disposition a swarm of designs and icons to be utilized in one's own web site. There is everything: from postcards, to buttons, to some very beautiful backgrounds for pages '10 and laude'. Hedgehogs and daisys are the main themes, but there are also other animals such as the very tender stork for the birth announcement of a baby. Inside the site there is also a section dedicated to charts for cross-stitch embroidery (they are free) and they are very nice. What else have to be added? Go and have a look. You'll be enraptured as it happened us! On February 13. 1999 the Swedish evening paper Expressen had a special Valentine's day page where they recommended some sites. This was a major break-through for me. Stats went up from 300 to 800 visitors a day.